Let me present my app to you, "Stack Reputational" (available at http://sr.ericbae.com). You can also click on each user to view even more information about that user. Very soon, I hope to add features to rank users by their interest topics and compare countries, states and cities to see which regions of the world are highly ranked in Stack Overflow community. UPDATE: You can now rank the users based on different topics! Find out who has the highest rank in C++ aged between 20-30 living in UK! Now that's a detailed ranking. Sounds cool? Well head over to "http://sr.ericbae.com" for a test-drive. There's nothing to download and it's accessible via the web. Stack Reputational was created by me "Eric Bae". I blog sporadically at "ericbae.com", or you can follow me @eric_bae on Twitter for any more information. 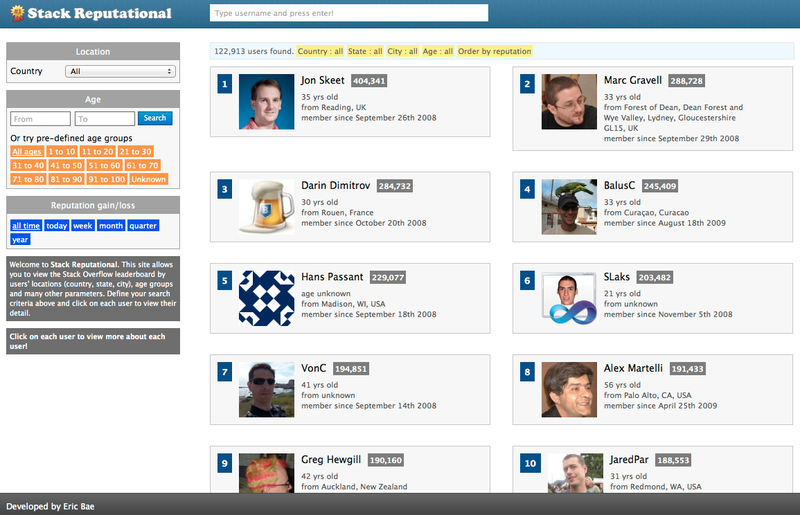 NEW - it now lets you rank users by the topics they are interested in! Bug fix on changing cities and states for displaying user rankings properly. Browse other questions tagged app website coffeescript .